Thursday and it’s bloomed out with 7 beautiful blooms and 2 buds remaining. As soon as I got it home I cut off the cellophane and set it on an end table about 2 ft from an east facing window. 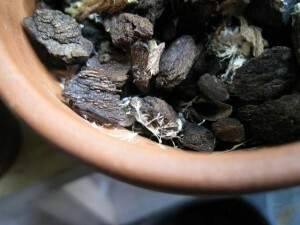 First… Take a deep breath :-) Mold on orchid bark is something many orchid growers deal with. You’ll want to read this post carefully because it can spread quite rapidly from the bark to all of the roots where it can suffocate the plant and kill it. If the blooms on your plant have not been affected, then you still have time to treat your orchid before severe damage is caused. Unfortunately, we sometimes bring orchids with early stages of mold growth into our homes without even knowing.  This is why it is crucial you inspect your orchid well before purchasing it—look for any signs of pests and disease. Look under the leaves, dig into the potting mix a bit if you can, and examine the roots if potted in a clear pot. Of course, mold could be hiding deep within the pot, or pest eggs hiding in the plant may not have hatched yet (thus no visible damage), which is why we want to always remember to quarantine all new orchids for at least 3 weeks. What Should You Do Once You Find Mold?